We deliver to the areas of Goleta, Santa Barbara, Montecito, Summerland, and Carpinteria. All deliveries are on Saturdays between 12 and 8pm. If you are unsure if we deliver to you please email us at info@localharvestdelivery.com. What are my choices for delivery frequency? Is there a long time commitment? You can subscribe to weekly, every other week, monthly, order just once or whenever you would like. There is NO commitment when subscribing. You can also skip deliveries anytime you need to. No. We pack your produce in wax boxes which keeps the food fresh for several hours. We also pack your cold items in special cooler bags with ice packs. So you do not need to be home but should be back sometime on Saturday to put it away. Also be specific in your delivery instructions on where we should leave your box, preferably out of the sun and in a shady spot. 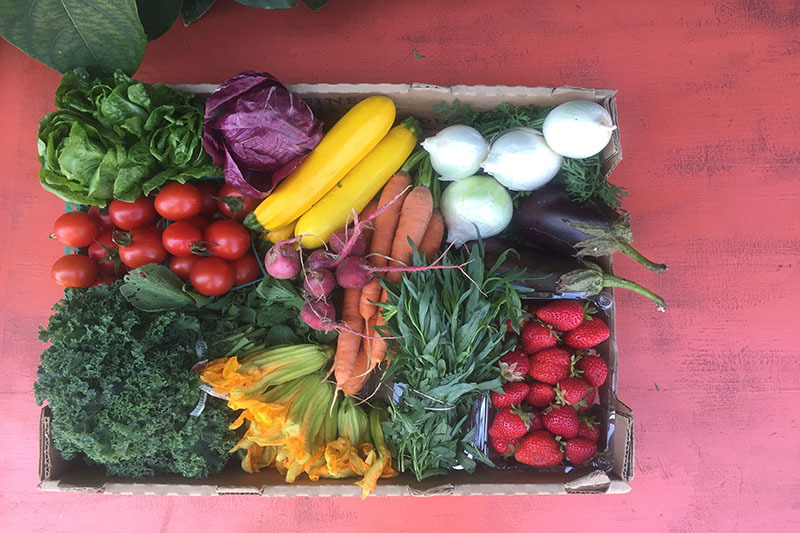 If you order one of our harvest boxes delivery is free. If you order a la carte and reach a minimum of $50 delivery is free. A $10 delivery fee is only charged if you order a la carte and your order is under $50. Do I return my empty harvest box? Yes! Please remember to put out your empty produce box at your designated delivery spot for us to pick up. What if I forget to leave my empty harvest box at my next delivery? If you forget to return your boxes for a week or two do not worry just leave them out on your next scheduled delivery day. We charge $2.50 per unreturned box, but we do not start charging unless it has been over 3 deliveries without box return. Cold bags and ice packs need to be returned as well. This helps us keep costs down and lower our footprint on Mother Earth. You can change, postpone or cancel your service at anytime. The only restriction is you must log into your account and make these changes before our deadline which is Wedneday at 3pm before your Saturday delivery. If you need to cancel after the Wednesday 3pm deadline email us at info@localharvestdelivery.com and we will do our best to accommodate you. Yes! Customizing your box is our speciality. You can choose a harvest box and sub item for item to make it just what you want. Or you can order a la carte and create your own perfect box. We will charge your credit card each Thursday before your Saturday delivery. If you need an alternate billing schedule please email us and we can see what we can do. In the event that we miss your delivery or you are not satisfied with your order we will refund you 100 percent of the charges. If you are unsatisfied with part of your order we will either replace, refund or credit your account depending on your request. If your credit card is declined, we will inform you to update your account information. We will usually still deliver your box and jcharge you when you get us the correct information. What if an item is of poor quality? Let us know right away. We take pride in the quality of the produce we choose for you but if an unacceptable item slips through we will replace it with your next order. We want to ensure that you are happy with every harvest box you receive! From local farms most of the farm’s we work with attended the Santa Barbara’s farmer’s market. We pick up our orders early Saturday morning and deliver them directly to your door all in one day. This means your produce was picked within 24 hours of its arrival and is extremely fresh. Very tasty too! Why is our produce better than what you can buy in the grocery store? The produce we deliver is picked ripe unlike grocery store produce that needs to be picked ahead of time to withstand the shipping and shelf life of the store. With time store produce looses its nutrition and taste unlike ours which is at its peak nutrition and taste. How do I use the software system? You can manage your account, customize your harvest box and order more from our store. Check out our video here on how to use our system. Email us at info@localharvestdelivery.com. We will get back to you ASAP. We are happy to answer any and all questions. We usually reply within 24 hours as customer service is our top priority.